7 nights (Monday to Monday or Friday to Friday) – cost $800. * Ski season is from the 1st Monday in June to the 1st Monday in October. If not previously paid, a bond of $300 is required. Check in time is from 2:00 pm and check out time is by 10:00 am. Outside of the ski season, normal charges and arrangements apply – each booking incurs a fee of $550 and bookings can be no more than 7 nights. 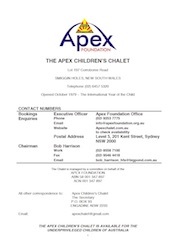 The Apex Children’s Chalet was designed with the assistance of eight underprivileged children. The Apex Children’s Chalet was designed with the assistance of eight underprivileged children who had each experienced the psychological and physical hardship when accessing services within Contemporary Australian Society. 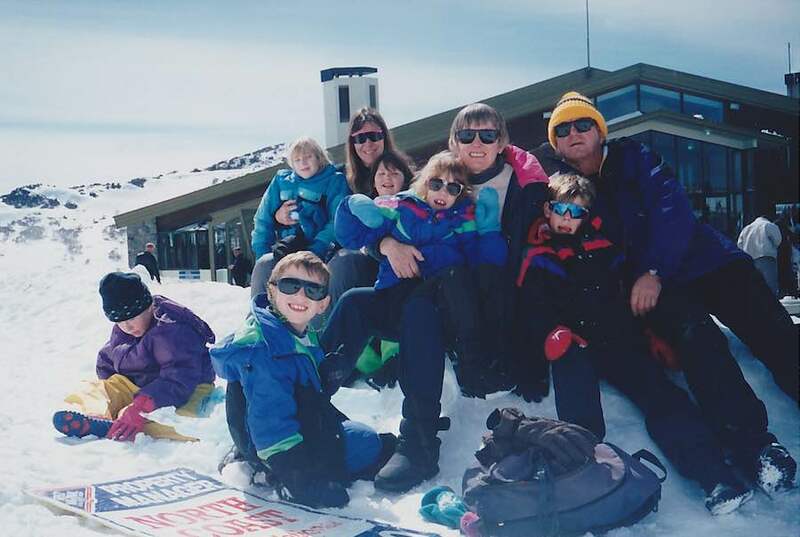 The Chalet was built to give these boys and girls the opportunity of experiencing the wonders of snow in the high country and in recent years to expose them to the wonders of the Snowy Mountains in summer. Your comments on the Chalet are welcomed by the Management Committee. There are over a quarter of a million underprivileged children in Australia. It is our wish to provide The Magic Castle for as long as possible for as many of these children to use. Please take care of the Chalet as it is now a part of our children’s heritage. All rubbish to be deposited in the waste disposal bins located near the Smiggin Holes service sheds on the main Perisher Valley Road. There are industrial vacuum cleaners within the Chalet. Please vacuum the chalet regularly during your stay and especially directly before you leave. Please ensure that the bathrooms and toilets are scrubbed clean before you leave ready for the next group. There are adequate mops, buckets and cleaning utensils in the kitchen and pantry storage. Please wash and wipe up regularly and keep the kitchen and dining room tidy. Please ensure that all rubbish is taken to the industrial waste bins located near the Smiggin Holes work depot at the main road. Do not leave any rubbish outside the back door of the chalet as it attracts rats and foxes. The caretaker occupies a flat within the Chalet. Please respect his privacy. In the event of a dire emergency the building may be exited through the passage in front of his flat on the upper level. The caretaker is not paid and he needs to find meaningful employment within the mountains. His main role is to provide us with a presence to provide security for our asset. He is required to maintain and display personal standards of behaviour as would be expected in an environment where children are involved. He does not have a role in supervising children but the Management Committee would encourage him to speak with supervisors if problems arise. He reports to the Committee on major maintenance issues and/or if the Chalet is left in an untidy or unclean state. He maintains stocks of light bulbs, cleaning gear and toiletry items. He will not necessarily be around on your arrival or departure but we encourage him to make himself known to Group Leaders as soon as is possible within his personal schedule. The ‘Skidoo’ over-snow vehicle is his private property and he has no formal responsibility to provide transport. Should any user group have serious complaints they should be directed to the Chalet Management Committee. The caretaker is to report to the Committee on the cleanliness following the departure of each user group.